Top Structure: Choose a horizon or specify a constant to define the top of the structure. If a horizon is chosen, an offset distance (TVD) can be added. The horizon must be in depth or convertible to depth (see How it Works (Time-Depth Conversion)). Base Structure: ("Dual" case only). Choose a horizon or specify a constant to define the base of the structure. 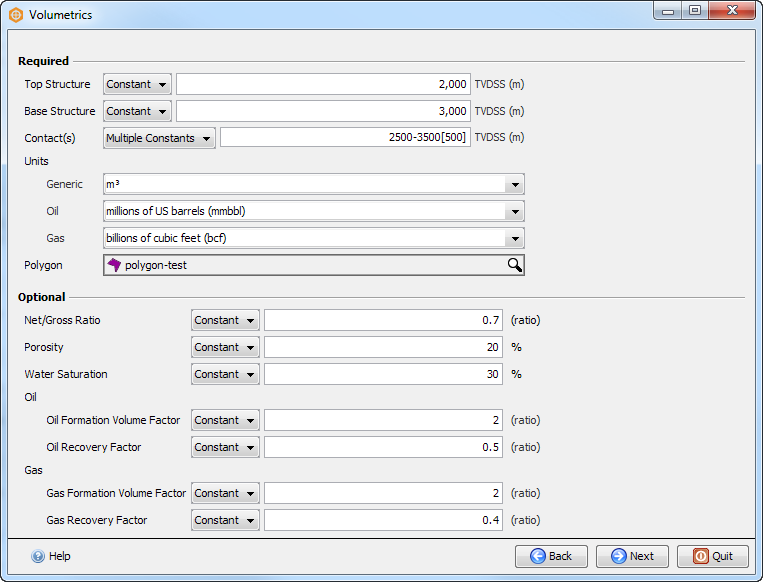 Note: Volumetrics calculates the Gross Rock Volume (GRV) unless the following parameters are specified. For the remaining parameters, provide a single constant or a horizon to define a spatially varying value. Porosity and Water Saturation are interpreted as ratios (0 to 1) or as percentages (0 to 100) if any value in the horizon is greater that 1. Values in the volumetric results table are rounded to 5 significant figures.